Jean-Pierre Vasarely (1934–2002), professionally known as Yvaral, was a French artist working in the fields of op-art and kinetic art from 1954 onwards. Combining the poetry of geometry with figurative art, Yvaral has created a wholly original body of artworks that has received the praise of important critics and museum curators around the world. Yvaral grew up in a complete artistic ambiance. Working alongside his father, Victor Vasarely, he discovered and explored the beauty of geometry in art. The inspiration of the French Impressionists and Pointillists is evident in Yvaral's vibrant paintings. The artist juxtaposes pure colors next to one another to achieve the illusion of three-dimensional forms. Graphic Arts Studies and the Ecole des Arts Appliques (School of Applied Art) in Paris. 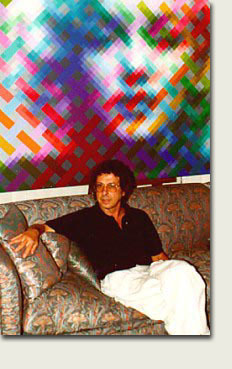 Co-founder of the Groupe de Recherche d'Art Visuel (Visual Art Research Group) in 1960, with which he exhibited throughout the world until 1968. Through his search for a geometric vocabulary (cubic structure, structured horizons,) and his desire to codify visual constants, Yvaral attempts to define a digital art (a concept of digitalized image) using his past experiences and by means of new manipulations that are possible due to the technology of our era.